Mr. Adrian Fu, Chairman of Fu Tak Iam Foundation delivered his speech at the First Graduation Ceremony of the LLM Program for Chinese Judges on 8 January 2010. When CityU very kindly invited me to address the first graduating class of the LLM Program, my wife suggested that my preparation be done in Putonghua. However, on second thought, the prospect of sharing top billing on YouTube with my good friend from Macau dampened my enthusiasm somewhat. I have therefore decided that I should entertain you over another occasion. On the subject of YouTube, as you well know, this company is one of the recent success stories in the IT industry. In the business world, any start-up business would naturally carry the highest risks for investors but they also bring the highest potential return. The investment risks, however, can be mitigated by thorough and properly conducted due diligence. 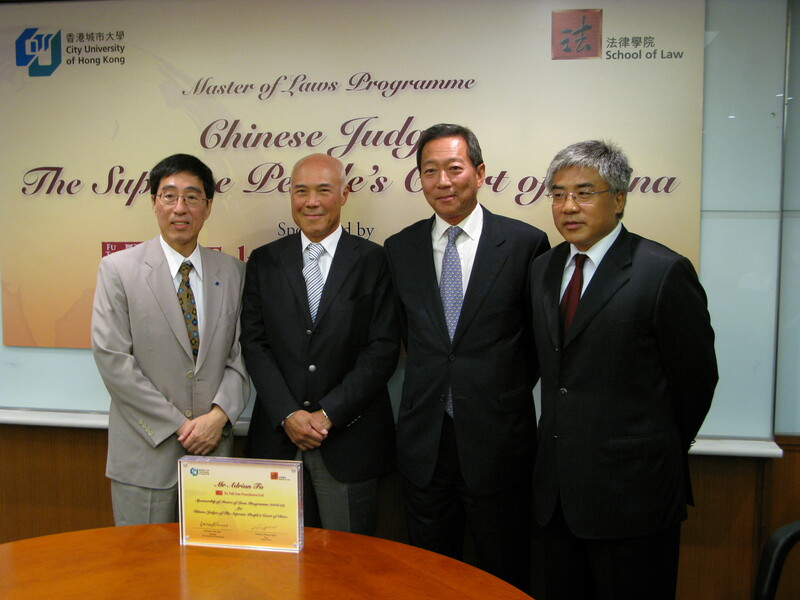 When CityU approached our Foundation two years ago to sponsor the inaugural LLM program for Chinese judges, it was a pioneering program, which is not unlike a start-up business. We, at the Foundation went through our normal due diligence process and having achieved a level of comfort with the partners involved in the project. With support coming from the Supreme People’s Court (of PRC) in Beijing, Columbia University Law School and CityU, we felt that the project’s success is assured. Those who have worked with us understand that our Foundation is very careful with money. Our operating philosophy is to save much from what we earn and give much from what we save. As participants in this Program, you have been exposed to both the UK and US legal systems. More importantly, you have experienced how both systems are applied in the two most developed financial centres in the world, New York City and Hong Kong. We in Hong Kong pride ourselves, despite the many constraints imposed by our land size and the high population density, for having created one of the safest cities to live in. Despite an economy, which is tiny by country standards, Hong Kong manages to rank as one of the four key financial centres in the world. This success story is built upon a stable legal system providing law and order to all citizens regardless of race and/or social standing. As graduates of this unique curriculum, you are equipped with privileged knowledge and information, which come with certain responsibilities and expectations not dissimilar to being the eldest child in a Chinese family! After leaving here, some of you might be furthering your careers in your respective home provinces; some might decide to pursue other interests in serving the country. Regardless, there is high expectation that once at home you would take on the role of ambassadors. One of your missions is to share your newly acquired knowledge and broadened horizon with your colleagues and hopefully, with the multiplier effect, achieve the ultimate objective of improving the quality of life for your nation’s 13 billion people. We realise that this is a visionary project and results cannot be measured over the near term. But we do know, by monitoring your academic performance and future career paths, whether the Program is on the right track. We also wish to remind participants that this Program is not designed to offer short cuts for personal career gains; the human and financial resources invested here are for the benefit of the people. On behalf of the Board of Trustees of the Fu Tak Iam Foundation, I wish to thank our partners the City University of Hong Kong (School of Law), Columbia University Law School, the Supreme People’s Court (of PRC) and the many hard working people behind the scene who contribute to the success of this project and of course, our congratulations to the graduating class of 2010. This pioneering Program marks a milestone for legal education in Hong Kong and China. By creating a platform for exchanges in the judicial development and legal education between the two jurisdictions, it aims to widen the exposure of Chinese judges to international legal systems and bring improvements to the judicial system in China in the long run. The Program is a customized program for Chinese judges under the tripartite agreement of the School of Law of City University of Hong Kong (CityU), the Supreme People’s Court of China and its National Judges College and the School of Law of Columbia University, USA. It admits 30 Chinese judges each year. The Chinese judges learn the key common law subjects in addition to a short internship in local courts. They also participate in a one-month study in the School of Law of Columbia University. Fu Tak Iam Foundation fully supports the Program for 3 years starting 2009.